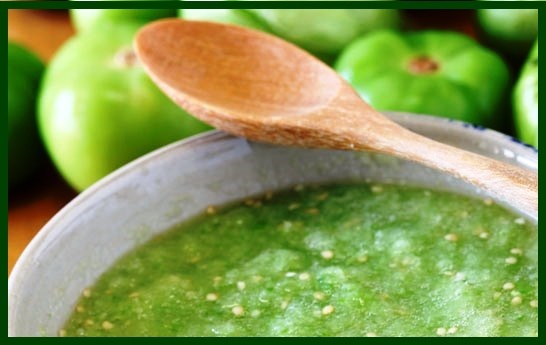 Tomatillo or tomate verde was originated in Mexico and was cultivated by the Aztecs centuries before the Spanish explorers introduced it in other parts of the world. The Yucatán peninsula in Mexico and Guatemala are the main husk tomato growing-regions in Mesoamerica. It is grown in small parts of California, Louisiana and other Southern states in the USA. Fresh fruits are generally imported from these Central American countries. 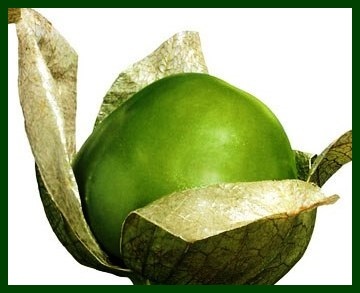 Tomatillo is a small spherical shaped vegetable covered by a papery husk. The fruit is the member of the nightshade family of fruits and vegetables, which also includes tomato, potato, eggplant, chili peppers etc. Some of the common names include tomate verde, miltomate, husk tomato, tomate de cascara, tomate de fresadilla etc. 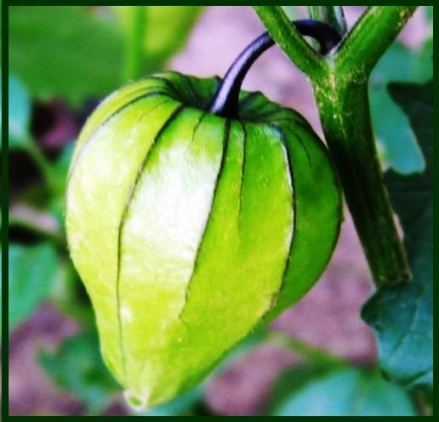 The tomatillo plant is a small annual glabrous shrub featuring similar growth characteristics as that of tomatoes. It grows to about 30-60 cm in height and bears beautiful yellow color flowers, which appear about 60 days after seeding. 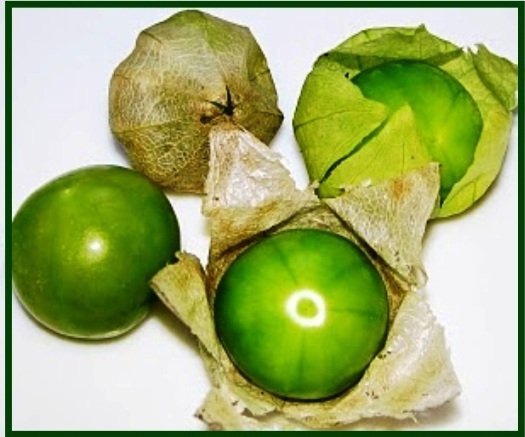 Unlike in tomatoes, tomatillo berry develops inside a thin, semitransparent calyx or husk resembling somewhat like Taiwanese lantern. Later as the fruit matures, its calyx splits apart to expose a green color berry from inside. The fruit measures about 2.5-6 cm in diameter, weigh about 50 g. From inside; its juicy pulp features tiny seeds just as in the tomatoes. 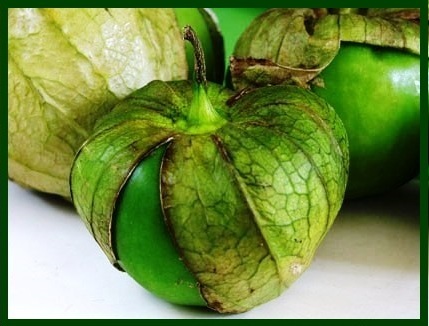 Tomatillo contains small amounts of anti-oxidant vitamins like vitamin A, vitamin C, vitamin E and vitamin K. Further; it contains flavonoids anti-oxidants such as ß-carotene, zea-xanthin and lutein. It is also a good source of copper, iron, phosphorous, manganese, zinc, selenium and other minerals. Blood Pressure and Heart Health: The positive ratio of potassium – sodium in tomatillos means that your blood pressure can be reduced. Potassium is a vasodilator, meaning that it relaxes blood vessels, reduces the strain on the cardiovascular system, and promotes circulation and oxygenation to vital areas of the body. 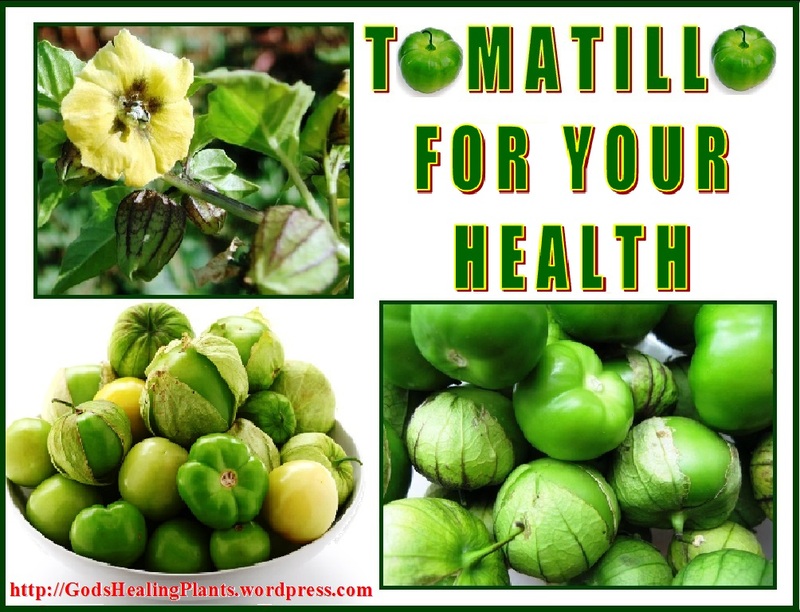 Furthermore, when combined with a high fiber content, which can reduce “bad” cholesterol levels, tomatillos can promote heart health by reducing the chances of atherosclerosis, heart attacks, and strokes. 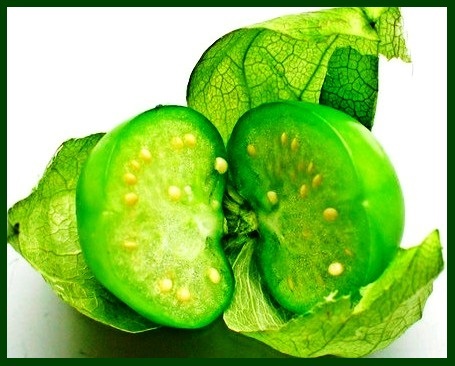 Cancer Prevention: Tomatillos contain unique antioxidant phytochemicals called withanolides, which have been directly linked to anti-cancer and antibacterial functions. Antioxidants help to combat the effects of free radicals, which are the dangerous byproducts of cellular reproduction that can kill or mutate healthy cells and turn them into cancerous cells. Furthermore, the vitamin A, vitamin C, and flavonoids within tomatillos provide other cancer-protective effects, particularly in terms of lung and oral cancers. Digestive Health: Most vegetables possess a high level of dietary fiber, and tomatillos are no exception. This means that they are very good for digestive health, as fiber can help add bulk to foods and speed their transit through the digestive tract, thereby eliminating constipation, excess gas, bloating, cramping, and even more serious conditions like colon cancer and gastric ulcers. Furthermore, fiber is very good at regulating the release of carbohydrates (simple sugars) into the bloodstream, thereby regulating blood sugar levels, which is important for people suffering from diabetes, who need to strictly control their glucose and insulin levels. 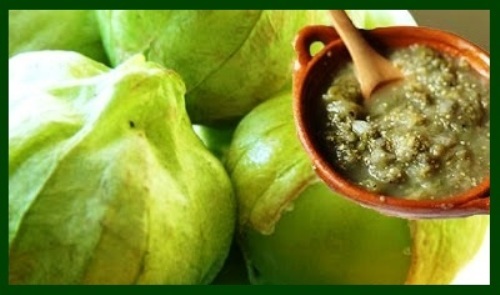 Immune System Health: The vitamin C found in tomatillos can help to boost the immune system by stimulating the production of white blood cells, the body’s primary line of defense against foreign agents and pathogens. Vitamin C is also a key component of collagen production, which supports the health and creation of skin tissue, as well as the cells and tissues that make up our organs and blood vessels, increasing the body’s sustainability and metabolic functions. Vision Health: Vitamin A has long been connected to the health of our vision. Tomatillos also contain beta carotene, a derivative of vitamin A, which functions as an antioxidant and prevents macular degeneration, cataracts, and other conditions that can affect the health of our eyes. Weight Loss Efforts: Tomatillos are one of those preferred vegetables for people who are trying to lose weight. High-nutrient, low-calorie, and low-fat vegetables with high fiber content, like tomatillos, help people to feel full, acquire the necessary nutrients on a daily basis, and reduce the chances of overeating, because they feel satiated. 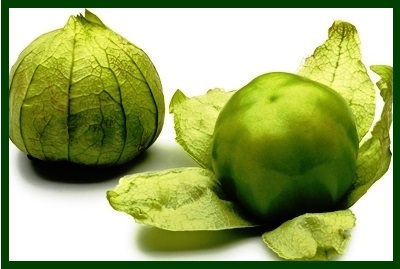 Tomatillos are ideal if you are trying to reduce obesity for a healthier lifestyle. 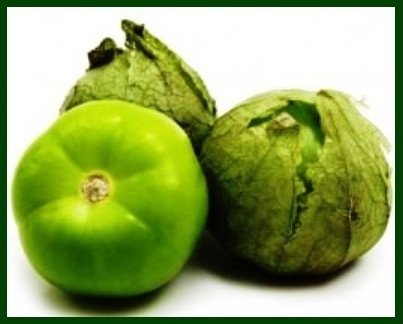 Tomatillos are available in most large chain grocery stores. Because they are an essential ingredient in Mexican cooking, they can always be found in Latino markets, where they are also available canned. Select tomatillos as you would tomatoes, choosing those that are firm rather than soft. By the time they reach the market, their husks are often partially opened, making it easier to choose tomatillos with good color. Avoid sticky and yellow, or purple ones, as they appear over-mature and soft. Store them in the refrigerator with the husk until ready to use. 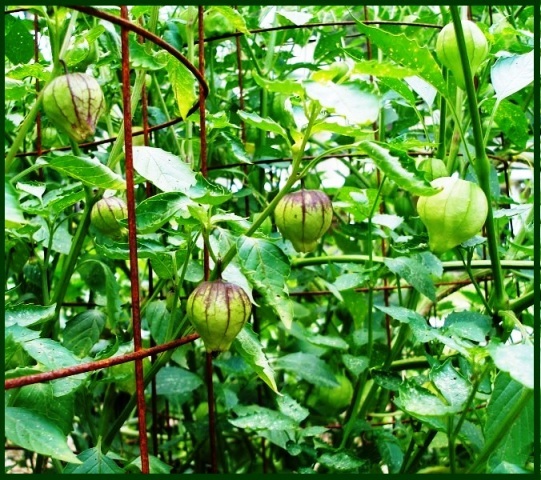 If the tomatillos are fresh, they will store up to two weeks in good condition. However, like any fresh vegetable, they should be used soon after purchase. To preserve longer, remove the husk and store the green fruits inside the refrigerator placed in a zip pouch. Tomatillos can also be frozen whole or sliced. To prepare, peel the husk by hand and wash them thoroughly in cold water to remove the sticky residue from the surface. Fresh tomatillos can be used raw and cooked in recipes. Tomatillos can be chopped and added to any salad. Tomatillos make an excellent addition to a raw soup when you want that tangy taste. 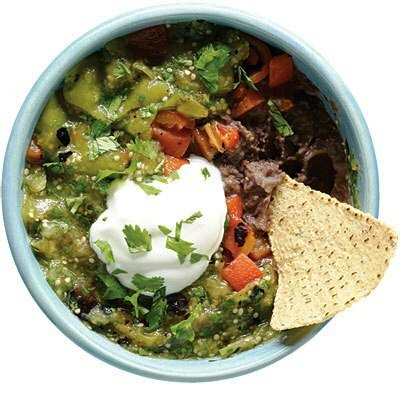 Begin with just 1 tomatillo in the blender along with your other soup ingredients. Add more as needed. Make your own “Salsa Cruda” (Raw) with chopped tomatillos, chopped tomatoes, chopped onions, chopped jalapeno, chopped cilantro, lime juice, and a touch of salt. 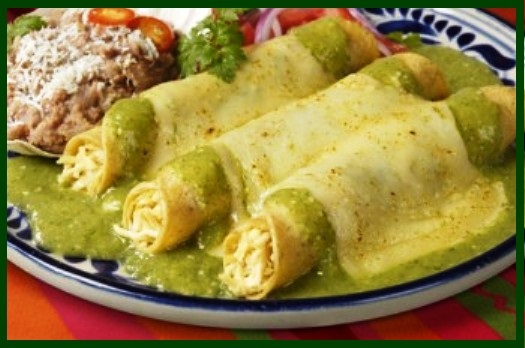 Salsa Verde is a typical sauce served with tortillas, enchiladas or burritos. Combine chopped tomatillos, chopped onions, chopped cilantro, chopped garlic, chopped serrano chiles, salt and pepper in a saucepan and cook gently 6 to 8 minutes. Tomatillos can be briefly stir fried in a little olive oil, vegetable broth, or water. They have a high water content so don’t add too much liquid. Cook along with some onions, garlic, and bell peppers for a tasty side dish. Season to taste with a little salt and pepper or any other seasoning of choice. 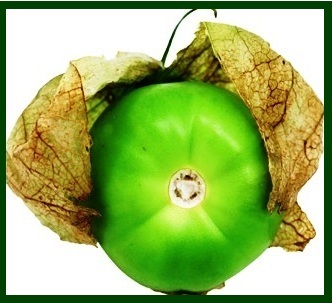 As a member of nightshade family plants, tomatillos, may often cause allergic-reactions in some sensitized persons with symptoms like skin and itching eyes, runny nose, gastrointestinal disturbances like pain abdomen, vomiting and diarrhea. Cross-reactions with other members like eggplant, tomato, etc., may also occur. It is therefore advised to avoid them in food in cases of known allergic conditions. NOTE – All content published on this site is the commentary, opinion, research or witness belonging to various sources and personal experience, and is offered for educational purposes only. God’s Healing Plants takes no responsibility and assumes no liability for the use or misuse of the information presented here. Always consult your doctor or specialist before making any treatment. I love using Tomatillo’s in salsa. Tomatillos are great and make the perfect ingredient for a delicious salsa. Thank you for posting this article from God’s Healing Plants. Blessings.